WACO, Texas (June 26, 2017) – Baylor University graduate Mima Fondong, B.S.Ed. (Health Science Studies/Pre-med) ’17, has been awarded a Global Grant Scholarship from the trustees of The Rotary Foundation. She will attend the University of Westminster in London, England, to pursue a master’s degree in global public health and nutrition. Fondong is the daughter of Stella Gwandiku-Immanuel of Alexandria, Louisiana. She is a 2013 graduate of Alexandria Senior High School. Fondong’s Rotary Global Grant was made possible by the generous donations to the foundation by Rotarians in Rotary District 6190, composed of 32 Rotary Clubs in central and north Louisiana, including her hometown Rotary Club of Alexandria. Rotary Global Grants support international activities, including humanitarian projects, graduate-level academic studies and vocational training teams. Applicants must propose a sustainable, measurable outcome in line with one of the Rotary’s six areas of focus: promoting peace, fighting disease, providing clean water, saving mothers and children, supporting education or growing local economies. Fondong’s Rotary area of focus is disease prevention and treatment. Fondong will begin her studies at Westminster in August. After her master’s degree, she plans to attend medical school in the United States with a specialization in emergency medicine. “My goal is to continue learning and investing in my education so that I can use all of what I've learned to one day invest in the lives of my future patients,” she said. At Baylor, students experience a growing academic enterprise that ignites educational excellence, leadership and research discovery. Undergraduates, like Fondong, are encouraged to maximize their education through a variety of research and scholarly activities found both within the classroom and beyond. Led by dedicated professors and a commitment to Christian values, students are provided with the tools to lead, serve and succeed in their future. “My freshman chemistry professor, Dr. Bruce Hodson, always made me feel welcome in his office and introduced me to plenty of resources that would lead to my success in his class. My organic chemistry professor, Dr. Paul Zinke, single-handedly made me feel like I was smart and capable in a class that could arguably be considered one of the hardest courses in the pre-medical track. Lastly, but not least, my research professor, Dr. Yunsuk Koh, pushed me past professional and academic limits that I didn't even know existed,” Fondong said. “These three professors, in combination with countless other professors, supervisors and staff at Baylor, have molded me into the person that I am today. The unwavering support at this University is such a blessing and is honestly one of the reasons I decided to attend Baylor,” she said. Koh, Ph.D., assistant professor of health, human performance and recreation in Robbins College of Health and Human Sciences, said Fondong had a strong passion for medicine and public health and worked hard both in the classroom and laboratory to accomplish her goals. “I still remember what she told me during our first meeting, ‘Dr. Koh, I don’t know anything about research, but I’ve wanted to get involved and to learn more about research if I can do something later in the future to help other people,’” said Koh. Under Koh’s guidance, Fondong conducted research as an undergraduate and presented her findings on “Relationship of Cellular Adhesion Molecules and Stress Hormones in Obese Males Following Exercise” at the Texas American College of Sports Medicine conference at Texas A&M University in March 2016. “Conducting a research study is not an easy thing to do for undergraduate students, even for graduate students. However, Mima successfully completed her research project, presented the findings at the TACSM conference and well represented Baylor. The Rotary Global Grant she received will encourage her to accomplish her goals and to grow as a future doctor/researcher in the field of medicine and public health,” Koh said. Fondong said she grew up surrounded by parents, aunts and uncles with careers in health care, and aspired from young age to be a doctor. 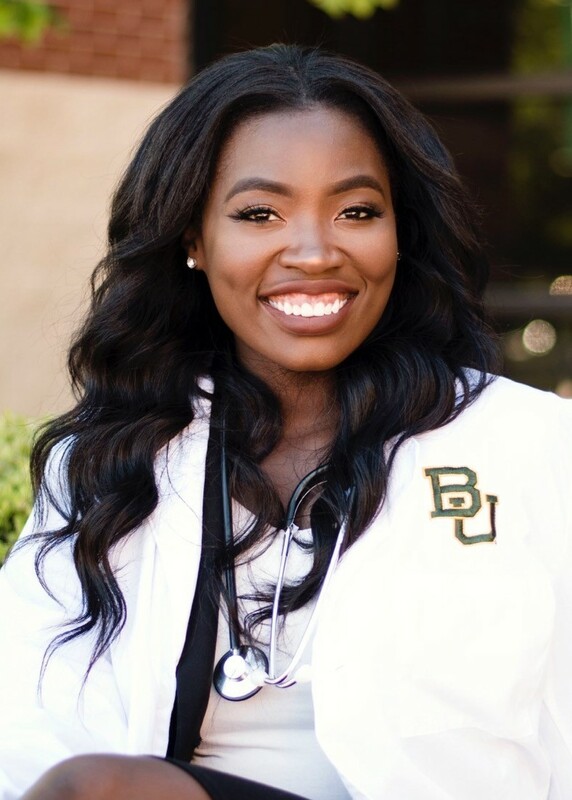 She researched colleges with esteemed pre-medical programs that would cultivate a pathway to medicine, with Baylor the first acceptance she received. The Rotary Club of Amersham, England, will be serve as Fondong’s host club, and Rotary District 6190 is the international partner. Members of the Rotary Club of Alexandria will serve on the grant’s international committee. They are Cindy Cespiva, district governor; Zeb Winstead, president; and Courtney Richter, board member. The Rotary Foundation is a not-for-profit corporation funded solely by voluntary contributions from members and friends of Rotary who support its mission to advance world understanding, goodwill, and peace. Using Rotary Foundation grants, Rotary's 35,000 clubs across the globe develop and carry out sustainable humanitarian projects and provide scholarships and professional training opportunities that promote peace, fight disease, provide clean water, sustain mothers and children, improve education, and strengthen local economies. The Foundation is a worldwide leader in the efforts to eradicate polio through its partnership with the World Health Organization, UNICEF, the U.S. Centers for Disease Control and Prevention, and the Bill & Melinda Gates Foundation.